A group of Alawite religious leaders have unexpectedly put forward a 10-point plan for peace in Syria that would see Bashar al-Assad out by year’s end. The plan comes as the United States and Russia try to settle their war of interpretation of the June 2012 Geneva Agreement, and after peace roadmaps by the Arab League, Kofi Annan, Lakhdar Brahimi and Assad dead-ended. The Alawite peace initiative was posted yesterday on the Facebook page of Dr. Hassan Ali Eid, an Alawite thoracic surgeon who was killed by unidentified gunmen as he left his home in Homs on September 25, 2011. 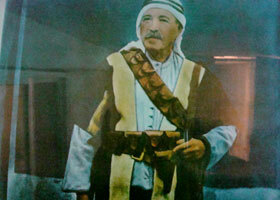 The late Dr. Hassan was the son of Sheikh Ali Eid al-Ali and a nephew of Sheikh Saleh al-Ali, the most prominent Alawite leader to join the Syrian Revolt of 1919, one of the first rebellions against the French mandate of Syria before the Great Syrian Revolt. 1. Everyone to lay down arms, withdraw armed men and military checkpoints from cities and villages and cease firing. Let that commence on April 1. All sides release all prisoners, detainees and abductees. Consider all Syrians killed since the beginning of the events as martyrs, irrespective of their affiliation or political belief. A martyrs committee is set up to compensate the family of each and every martyr. 2. Ask all non-Syrians to leave Syrian territory within one week of the ceasefire going into effect. Each side is responsible for its militants. 3. Set up within a week of the ceasefire a sufficiently empowered national committee of wise men to oversee implementation of the initiative. 4. Abduction or arrest of opposition or loyalist politicians is strictly forbidden under all circumstances. 5. A clear and unequivocal declaration and undertaking by President Bashar al-Assad not to run in early presidential elections to be held in the last quarter of 2013. 6. Lift all restrictions on the homecoming of all Syrians. 7. Set up an all-inclusive national committee for national reconciliation. 8. Evolve Syria into a civil state where all Syrians have equal rights and obligations within one year from the date of implementation. 9. During the transition phase (one year from the implementation date) the president of the republic hands over all his powers to a national committee of civilians and military, none of whom would be able to run for public office in the new Syria. 10. Total separation between state and political parties and a blanket ban on the army meddling in politics so it can turn into a professional army tasked with defense of the homeland’s borders. Editorially, political columnist Elias Harfouche all but suggests today that Syrian National Coalition (SNC) leader Moaz al-Khatib is proving to be a political novice. Writing his weekly column for pan-Arab al-Hayat, Harfouche says while the regime continues to daydream about military victory the opposition still fantasizes about ousting Assad without agreeing a way to do it. The latest proof of the opposition’s disarray was Khatib’s foiling of today’s planned SNC meeting in Istanbul to elect a provisional prime minister after the Arab League directed the SNC to form an “executive body to take up Syria’s seat” at the League and the upcoming Arab summit in Doha. “The most serious objection to the SNC leader’s obstruction of the Istanbul meeting is that it was a personal step – much as his earlier ‘personal’ offer of talks with regime representatives, which caused an outcry within and outwith the Coalition. “What is much more alarming, however, is that Moaz al-Khatib is misreading the political realities of the Syria crisis. He, along with like-minded opposition members, believe the door to dialogue remains open” when Assad and Russia have locked that door and thrown away the key. The problem, says Harfouche, is that political confusion in opposition ranks not only serves the regime well, but also undermines the resolve of Syrians dying and fighting on the ground and eats away the international backing they crave. Moaz al-Khatib quits Syrian opposition coalition!